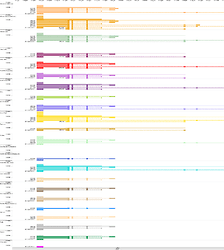 I created three visualizations of RNA-Seq data from the GTEx project (version 2013-03-21). They’re powered by JBrowse, the WashU Epigenome Browser, and canvasXpress. 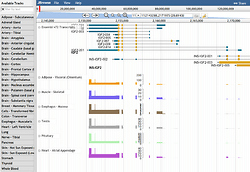 View expression of each coding nucleotide in the human genome (hg19). A nucleotide’s expression level is the sum of Gencode v12 transcript RPKMs. The transcript levels were quantified by the GTEx team using Flux Capacitor. If you have RNA-Seq data, do not use Flux Capacitor. Instead, you should use RSEM or Cufflinks. 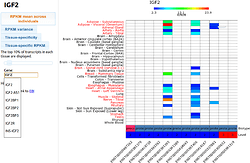 View the expression of Gencode v12 transcripts across 23 human tissues. View expression of all Gencode v12 transcripts for a chosen gene.